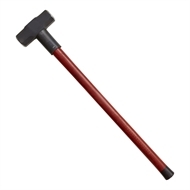 Whether it's for heavy duty DIY projects or small demolition jobs around the home and garden, the Craftright Sledge Hammer is suitable for the job. Designed with a hickory handle, for it's long lasting and durability effects, this sledge hammer is perfect for the home handyman. D.I.Y. Basics D.I.Y. Basics: Get to know your cordless drill We’ll show you what makes a cordless drill the ideal tool for drilling holes and driving screws. Bedroom D.I.Y. copper and timber bedside table This copper bedside table will add a modern touch of style to your bedroom and it is easy to make. Bedroom D.I.Y. rope headboard Learn how to make a rope bedhead. Planning & Projects How to design an open plan kitchen Kitchens today really are the heart of any home. People eat, celebrate, socialise, study and entertain all in the family kitchen. Here are some of our handy tips from kaboodle to help you create the perfect kitchen for entertaining in your home.